A Bed Stuy student marching band was picked to play the inauguration on January 20. Just one problem: They need to raise money to make the trip. The Brooklyn Steppers band needs to raise $20,000 through citizen donations to pay their way to D.C. to play the inauguration. 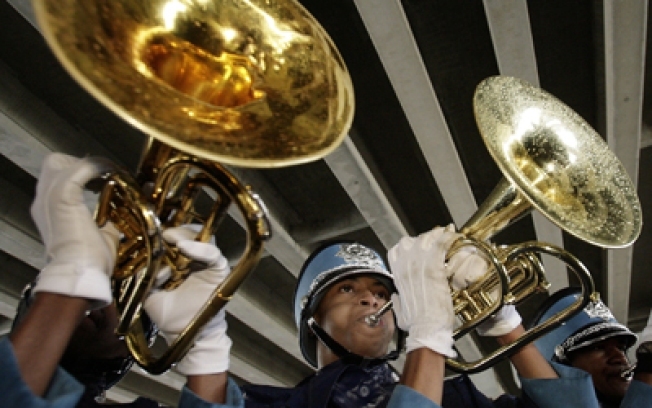 Talk about a worthy cause: We first read about the happy event on Brownstoner before the holidays, and now the Times has covered the Brooklyn Steppers, a marching band of Bed Stuy students who were selected from more than 1400 bands across the nation to play at the historical Obama inauguration on January 20. The catch? Since they're not and "officially sponsored school band," the kids -- aged 8 to 19 -- need to pay their own way to D.C., which the organizers estimate will cost about twenty grand (and doesn't include a hotel: the kids are going to camp out in sleeping bags in a local high school gym). The Times notes that the band includes some kids from poorer sections of Brooklyn. If you have $5 or $10 (or more) to give to the cause, go the Brooklyn Steppers website or call 718-467-1700 ext. 173. And think how proud you'll feel when you see Brooklyn's own performing a Stevie Wonder song on January 20.